Two comps and two cyclones – what is going on? Needless to say not as many members fished as usual, with landbased being the preferred option for those fishing the unusual conditions. Still great to see so many at the Weigh-In and BBQ. A total of 3 anglers weighed 3 fish for a total weight of 7.2kg and 136 points, with an additional 13 fish being released. 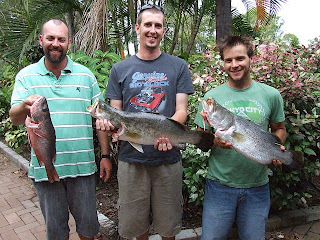 It was also great to see a couple of barramundi weighed – check out how close the point scores were!